Okay, people, this is gonna get personal. And maybe gross. And definitely awesome. If you are a man, especially if you are man who is related to me (brother, uncle, cousin, grandpa…), STOP READING NOW. This is about periods! Here goes. I use REUSABLE, WASHABLE MENSTRUAL PADS. Are you totally grossed out? Don’t be. 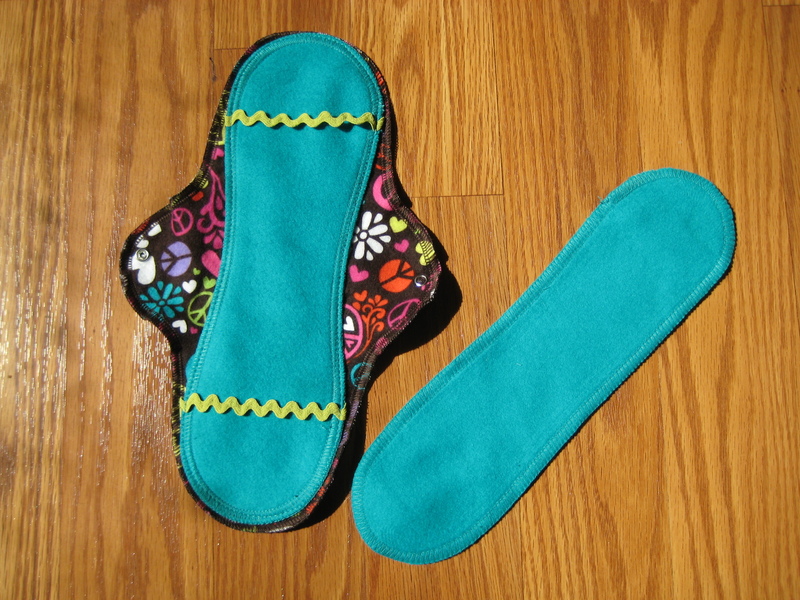 Reusable pads are not nearly as gross as you might think. They are not as much hard work as you might think. And they are cozier than you might think. I’ve been using them for several years now, and I have now become an ambassador to the company Lunapads. This means that I can give you a code for 5% off their products, AND I get a kick-back for referring you. So, yes, for the first time, I am using my blog to sell promote something. I tell the world about something I love, and you and I both win. The first time I used these reusable pads, I was surprised how much better it felt than plastic pads. It was like the difference between wearing an overly scented garbage bag between your legs and wearing a cozy pair of flannel pajama pants between your legs. I was sold. But how does it work? They are shaped exactly like pads, but instead of adhesive, they have a tiny snap. You wear a base pad, and then change the “inserts” throughout the day. Easy. But how do you, you know, deal with them and wash them? Short answer: You can wash them in the washing machine and dry them in the dryer. You can pre-soak them or not. Long answer: I keep an opaque jar in my bathroom, with a mesh laundry bag in it. I fill it with water and just let the pads soak in there. At the end of the day, I either change the water, or I take the jar down to the washing machine. To wash them, I transfer the mesh laundry bag to the washer, and then the dryer – and I never touch them. I wash the whole bag with my other clothes. It doesn’t get anything gross – I promise! The pads don’t even stain if you soak them like I do. Are they bulky? Yes, they are a little bulkier than plastic disposable pads, because you’re using real cotton instead of plastic to soak stuff up. I personally prefer to wear skirts, dresses, or a long shirt to cover my bum when I am wearing reusable pads. Do they leak? Not any more than any other product. Like any menstrual product, change it! Are you crazy? No. Maybe. I have never used my blog to sell promote something before, but I have been so excited about these things for so long and never knew how to talk to people about them. I finally have my chance. If you want to try them, please use the discount code below, which is linked to ME, and I will get a little kickback from the company for referring you. Win-win. If you are unsure if you want to try them, and are local to me, I have UNUSED, NEW samples of the products that I can show you. -I am not a salesperson. I do not sell any products, and I am not trying to get anyone else to sell any products. However, I am an official “Lunapads Ambassador”, which means that I *promote* their products. I do receive a straight percentage of each purchase I refer. -The views I expressed here are my own and do not necessarily reflect the views of the Lunapads company. So, can we talk about washing?? And how many YOU typically use per cycle? Thanks so much! Yay! I’m so happy I can help people know that there are other options out there! What would you like to know about washing? And, as for numbers, I use maybe 2 base pads first couple of days, and then only one base pad each day after that. I change the liners more frequently, as needed, and use maybe 3-4 per day? 🙂 Well…(maybe a stupid question) but, do you have to rinse pads out, or do any other “prep” before washing them? Any special detergent? Oh! I didn’t even realize there were base pads and also liners. That’s interesting! Also, just a blogging tip – I came back to your post to see If you had responded because I’m really interested. 🙂 I hadn’t gotten notified through WP because you have to click “reply” under the commenter’s comment, not at the end of the post. 😉 Just thought I’d share in case you weren’t aware of it. Sorry! I promise that I do know how to reply, haha! That’s what I get for trying to reply on my Kindle instead of my laptop… sigh. Anyway, PADS! You do not need special detergent. You do not need to soak them. It’s totally up to you. I prefer to soak them, because then they don’t stain as much. I go over it in detail in my post above, but I have a whole system set up where I don’t even have to touch them from the time I drop them into the jar until the time I take them out of the dryer. It’s easier than I expected. I just wash them with my other laundry, too. The first month was a little confusing, but after that, I figured out a system that works for me and it’s not hard. I first wanted to say that while I did find your article interesting and informative, I wanted to bring a few things to your attention because I am worried about some of the word choice and language used. For so long the idea of periods, even the thought of them, caused most people to stick their noses up with disgust. People see it as disgusting, shameful, and most want absolutely nothing to do with it. As LunaPads ambassadors and users (menstrual cheerleaders as I’d like to call us), I am worried that while you are endorsing the amazing benefits of menstrual cups/cloth pads, you are also falling victim to the idea that periods are disgusting/shameful. Another point I wanted to mention, though I’m not sure if you are aware of this already, is that LunaPads is now a trans-inclusive brand meaning that all people that menstruate, including those who do not identify as women, are also welcome members of the LunaPads family. I’m worried that statements such as : “If you are a man, especially if you are man who is related to me (brother, uncle, cousin, grandpa…), STOP READING NOW. This is about periods!” may perpetuate gender norms or imply values that you may not have. While I understand that you were trying to give a warning about the content to those whom would be least interested in this article, I think it’s important to remember the power our language has and especially the power YOUR language has on the diversity of your readership. Also, I wanted to hear your thoughts about continuing to exclude men from conversations about periods, because I personally think it’s important for EVERYONE to know about periods so it can be seen as a natural part of life, and not just as a disgusting topic that only women talk about in secret with no one in ear shot of them. I believe because more people have become aware and accepting of periods, due to menstrual cups and cloths, we are in a time where periods can finally stop being stigmatized and people can finally be accepting for what they are. Bloody and natural! I’d love to know how you feel about all of this, and I hope to hear from you soon, thanks! Hi India, Thanks for reading and thanks for your comment. First of all, I would like to say that you and I (and Lunapads) share the same goal: to promote period love! We are just coming at it from different angles. While I agree with you theoretically, I would like to point out that such a forward way of thinking does not always work out in the real world. The truth of the matter is (and you may find this out when you become an Ambassador): lots of people still get grossed out by talking about periods. And some people – women included – are not going to appreciate you bringing it up. My goal is to gently encourage people to think a different way. And to do that, I try to think like they do. I try to put myself in their shoes. I try to take baby steps with people. Now, I see from your email address that you are probably a college student. I would guess that you may be surrounded by people of similar ages and perhaps similar philosophies. I, however, have long ago left that wonderful world and have now entered a different world. A writer must consider her audience at all times. My audience is mostly family and church/mom friends who live in this conservative area with me. Many of them have told me, point blank, that they don’t want to hear about periods or anything like that. I respect that. Some have told me that just seeing the title of my blog posts disgusts them. I respect that, too, even if I disagree, so I find it completely appropriate to post warnings. Also, as I mentioned, most of my readers are family and friends. My male relatives might enjoy reading about my sons’ latest antics, but they don’t want to blindsided by reading about my period. Seriously. This blog is mostly about my children, and the period stuff is a mere footnote here. I also have other avenues that I use to promote my Lunapads business. That’s awesome! What’s old is new again!